Public water and wastewater services are vital public services and fundamental human rights. They are the foundation of safe and healthy communities. On World Water Day, we join water activists around the world to celebrate our work protecting and promoting public water and wastewater services. In Canada, the Conservative government is aggressively targeting municipal water and wastewater systems for privatization through public-private partnerships. Capitalizing on a major need to maintain, upgrade and expand water infrastructure, the federal government is offering P3 subsidies to cash-strapped municipalities, through a crown corporation devoted to promoting P3s. The Conservatives are also forcing municipalities to privatize through a mandatory P3 review of major infrastructure projects. Once deemed eligible by the pro-P3 crown corporation doing the review, a municipality will only get federal funding if it agrees to privatize. But the Conservatives are swimming against the tide. Over the last 15 years, more than 180 cities and communities in 35 countries have taken back control of their water services. This trend to remunicipalize is driven by high costs, poor quality and the outright failure of private corporations to deliver water services. In the coming federal election, CUPE members will have the chance to stand up for quality public services by electing a federal government that will strengthen our public services, including water and wastewater systems. The New Democratic Party’s plan to strengthen our public services begins with better funding for vital services and infrastructure through a taxation system where everyone pays their fair share, including corporations. Even though water is a human right, in 2015 many people still don’t have access to safe, clean drinking water and adequate sanitation services around the world, including here in Canada. CUPE’s Enough is Enough campaign has highlighted how over 120 First Nations have problems accessing safe drinking water. We will continue to work in solidarity with Indigenous peoples to defend their right to water, pressing the federal government to take real action on ensuring all First Nations, Métis and Inuit peoples have access to safe drinking water. We also stand together with the people of Detroit in their struggle to end water shutoffs, and fight the privatization by stealth of their water systems. We will continue to be part of the international call to stop the water cut offs permanently, to respect water as a human right, and to abandon plans to privatize Detroit water services. Be on alert for the early warning signs of privatization. CUPE members are the eyes and ears of our public services. Download our flyer at cupe.ca/privatization for steps your local can take right now, or order copies through our online store. Show your support for publicly-delivered water by backing the tap. CUPE is encouraging members to participate in Bottled Water Free Day on March 16. Take the bottled water-free pledge, and work to eliminate bottled water in your local, workplace or community. You’ll find background and campaign resources at backthetap.ca. 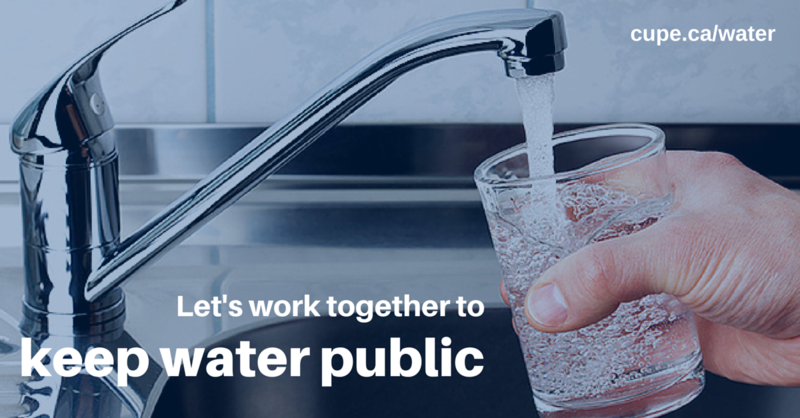 Together, let’s work for well-funded public water and wastewater systems at home and around the world.